All BMH School of Motoring instructors agree to abide by the Driving Standards Agency’s (DSA) code of conduct. Full details are available from the DSA. By starting lessons with BMH School of Motoring you are agreeing to the terms and conditions set out below. Instructors will demonstrate a high standard of driving at all times and be courteous to all road users. Pupils will be treated with respect and consideration at all times. Instructors will be treated with respect by all pupils in return. Instructors will try to avoid physical contact with a pupil with the exception of an emergency or in the normal course of a greeting. Pupils should wear appropriate clothing especially footwear to ensure they can maintain safe control of the vehicle. Pupils should advise their instructor of any medication being taken that may affect their ability to drive. Whilst reserving the right to withdraw tuition from an individual the instructor will not act in any way that contravenes discrimination legislation. Student’s mobile phones should be turned off to avoid distraction. Instructors will have phones turned to silent and will not use them during lessons except in an emergency. All vehicles are fully insured for driving instruction. They will be taxed and have a current MOT where appropriate. All vehicles are maintained to a high standard and will be clean and tidy at all times. Pupils must hold a current valid licence (either provisional or full) which must be produced on the first lesson. Pupils must also be able to read a number plate from a distance 20.5 metres (67 feet) using your glasses if normally worn. Payments for lessons should be made at the start of each lesson. Cheques should be made payable to your instructor and be made 7 days prior to the start of a course of lessons. Cancelation of lessons by pupils with less than 48 hour notice will be subject to a charge in full for the lesson, payable prior to the next lesson. Instructors have the right to waive this charge in extenuating circumstances. Your instructor reserves the right to postpone lessons if he or she feels that the weather or road conditions are unsuitable or dangerous. The instructor cannot be held responsible for any costs incurred as a result of him or her having to postpone any lessons, for whatever reason. Lessons will start and finish at points that are agreed by both parties. Pupils are to be punctual for driving lessons. The instructor will normally wait for up to 10 minutes after the agreed start time for the lesson after which if no contact has been made with the pupil the lesson will be abandoned and will be charged for. If your instructor is delayed at the start of your agreed lesson time they will contact you to let you know. Any time lost will be made up at the end of the lesson if possible or at a later date. Lessons will be for the time agreed i.e. 1 hour or 2 hours and will be charged for as per our current prices as stated on the prices page of our web site. Pupils will be given feedback at the end of each lesson on where and how to improve their driving. 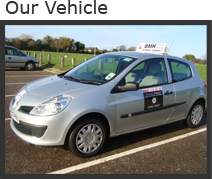 Driving test should be booked in consultation with your driving instructor to ensure the availability. Driving test will take priority over normal lessons and your lessons may be postponed to allow another pupil to take their test. Changes to your lessons as a result of a driving test will be notified at the earliest opportunity. In the interests of customer and public safety your instructor reserves the right to withhold the use of a car for the test if, in their opinion, your driving is not of an appropriate standard.